Serious Comedy says, “Princess is an excellent stand-up comedy CD” and named it a Top 10 release of 2012. The album contains a “101” of Alysia’s material (her views on cigarette addiction, anger management techniques, her dysfunctional family, meltdowns and more). It builds the foundation for future albums. There’s some random stuff in there, too, such as paranormal activity and oil change tips. TheSpitTake said Princess contains, “brilliant turns of acting… it comes across realistically even without the benefit of seeing her on stage.” This is great news, since Alysia failed her only acting class before dropping out of college. America’s Comedy said, “She uses her voice like a lion tamer uses a whip: there are times she’ll crack it sharply in the air to drive a point home or punctuate a punchline. Other times she’ll unspool it in serpentine loops to let it rise and fall to convey cartoonish absurdity.” “Princess” was also chosen by Virgin Airlines to entertain passengers in flight. It was recorded at the Joke Joint in Minnesota and produced by Grammy Award-winning producer, Dan Schlissel, of Stand Up! Records. The amazing cover was shot by Shannon Casey Splain and designed by Ian Rans. Every American woman knows that “princess” marks you as special, lovely, wonderful until you’re about twelve. From that point on, it’ll be used to keep you in your place. Well, screw being a princess. 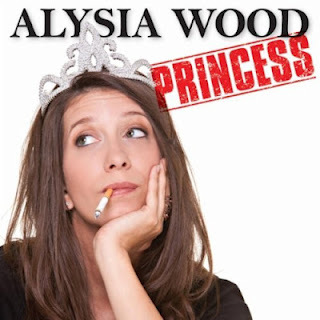 Alysia Wood’s comedy royalty, all right, but in this monarchy, she’s the monarch: responsible enough to know she’s irresponsible, smart enough to know she’s a success so long as she avoids a grave or a cell, and talented enough to drunk text coherently (if utterly, bewilderingly deceitfully), Wood’s clearly the one in charge. As the latest voice in Stand Up! Records’ chorus of comic standard-bearers, Wood brings deft timing, self-deprecating (but never self-hating) charm, and a load of well-deserved accolades (you don’t get named 2010’s America’s Next Funniest by Budd Friedman, founder of the Improv, without the chops to back it up) to the stage. Even better? We’re pretty sure she’s got a garage full of stolen TVs and cartons of Lucky Strikes. Now that’s a “princess” we’re proud to know. “Princess” is available on Google Play, i-Tunes, Amazon (actual CD or mp3) Pandora, Sirius XM, Spotify and more! CDs are generally available after live shows. Feel free to bring your copy to get signed. The CD was released on March 20, 2012. Alysia was a guest in the KING 5 “New Day” and KISS FM “Jackie & Bender” studios before the release parties in Seattle and Tacoma. A huge thank you to the Northwest media – also including The Weekly Volcano, NWCZ radio and Tacoma News Tribune – for all of the press coverage. Immense gratitude to the internet community and her facebook group for also spreading the word. For photos and a recap of the hoopla, including the New Day interview, click here.